Combine tandoori paste, 30ml (2 tbsp) of the juice, 350g of the yogurt, 2 cloves of the garlic and 2 tsp of the cumin a large shallow dish; season. Add chicken; turn to coat evenly, cover and refrigerate for one hour. Place drained chicken on tray, skin-side up. Roast for 45 mins or until browned and cooked through. Meanwhile combine 15ml of the remaining lime juice with the remaining yogurt, garlic and cumin in a small bowl or jug. Using a vegetable peeler, peel cucumbers into long thin ribbons. Combine cucumber ribbons with chilli, oil and remaining lime juice. 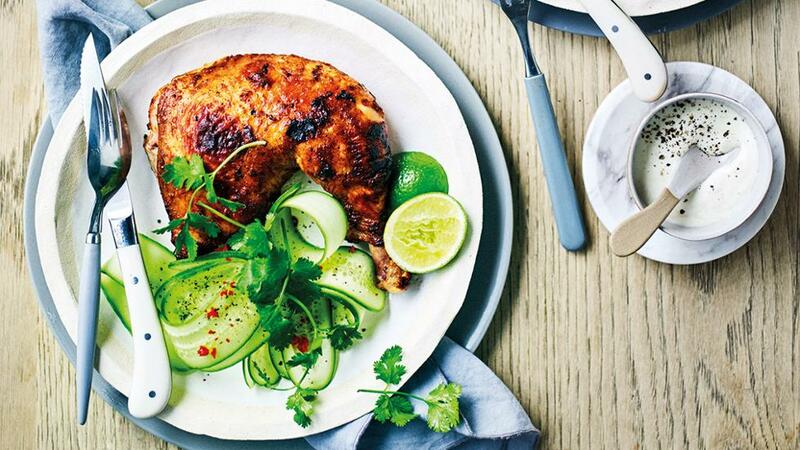 Serve chicken with yogurt mixture, cucumber salad, coriander and lime wedges.